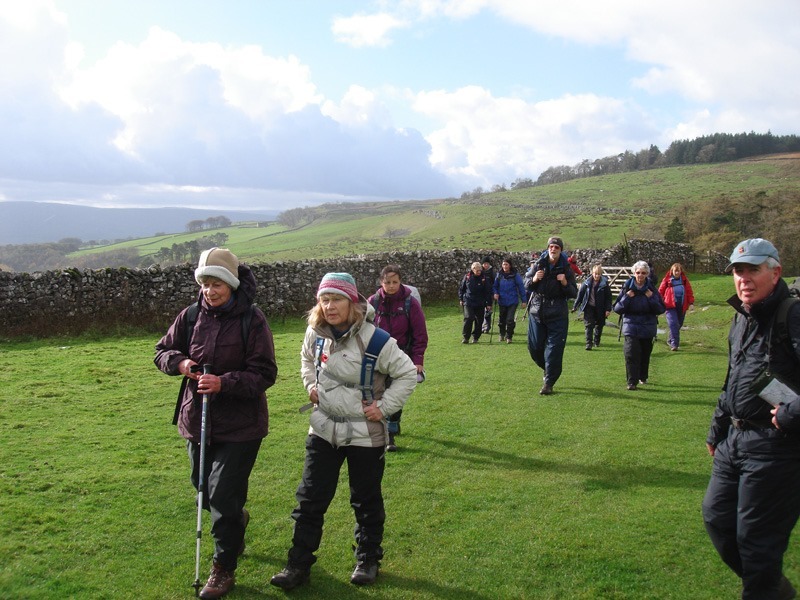 I was out with Crosby Rambling Club and joined the ‘B’ party on the walk led by David Lewis. The weather forecast said “Changeable” and it certainly was. 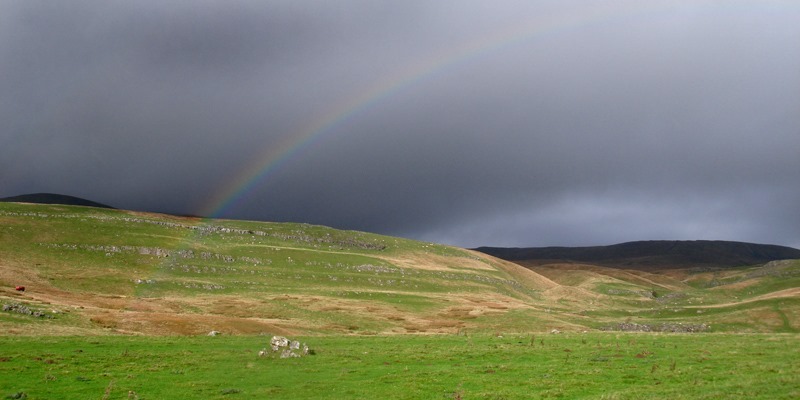 We had wind, rain, hail and the occasional sunny spell resulting in rainbows. It produced some dramatic lighting. 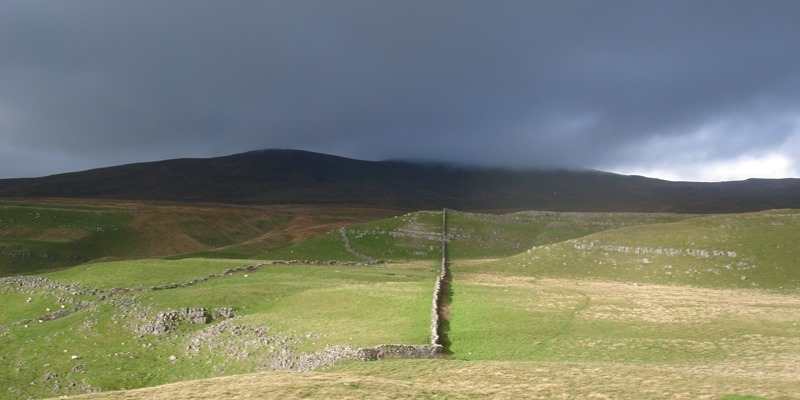 We headed northwards above Clapham Beck, passing opposite Ingleborough Cave and Trow Gill. The first shower swept in producing a lovely rainbow. In the distance Ingleborough stood out on the skyline looking quite menacing with cloud hanging over the top. We crossed the limestone bluff of Long Scar to reach Suber Gate at the head of Crummack Dale where we stopped for lunch sheltering behind the wall. In the distance we could see the ‘A ‘party making their way over Moughton Scar. 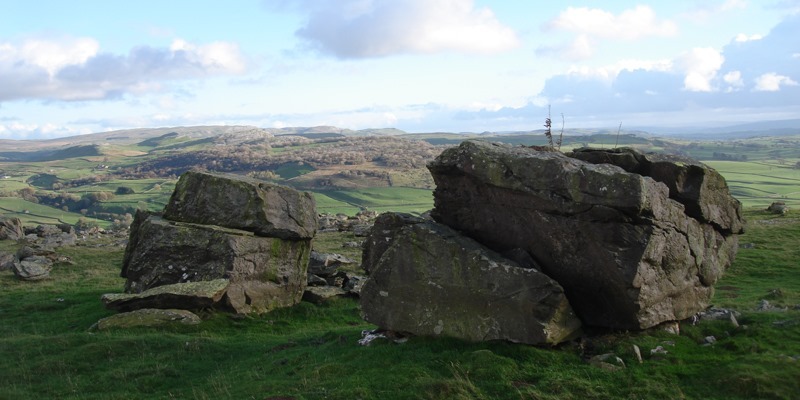 Panoramic view of Moughton Scar. The rain had stopped and we could appreciate the views of the scar and learn a little bit about geology. 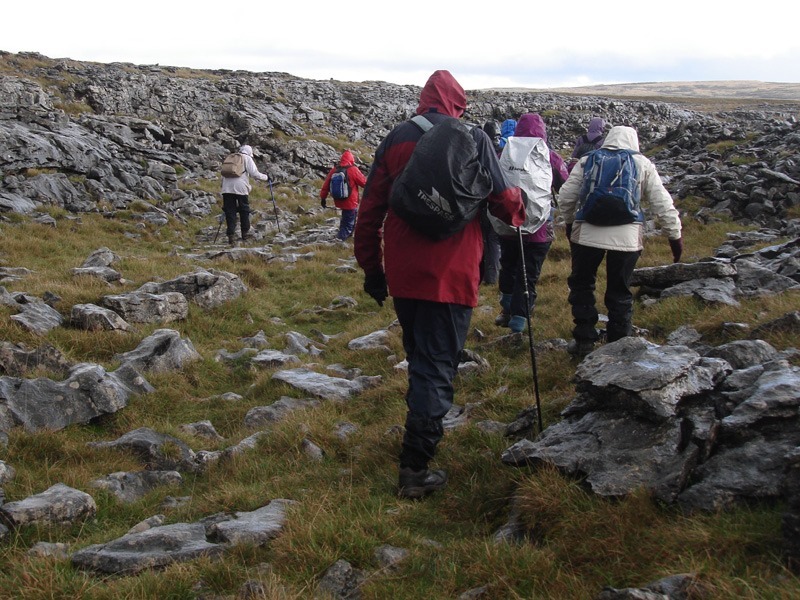 We descended carefully to Moughton Scar and made our way across the limestone pavement of Thieves Moss towards Beggar’s stile. It was then easy walking down Crummack Dale before we turned west to cross below Robin Proctor Scar. 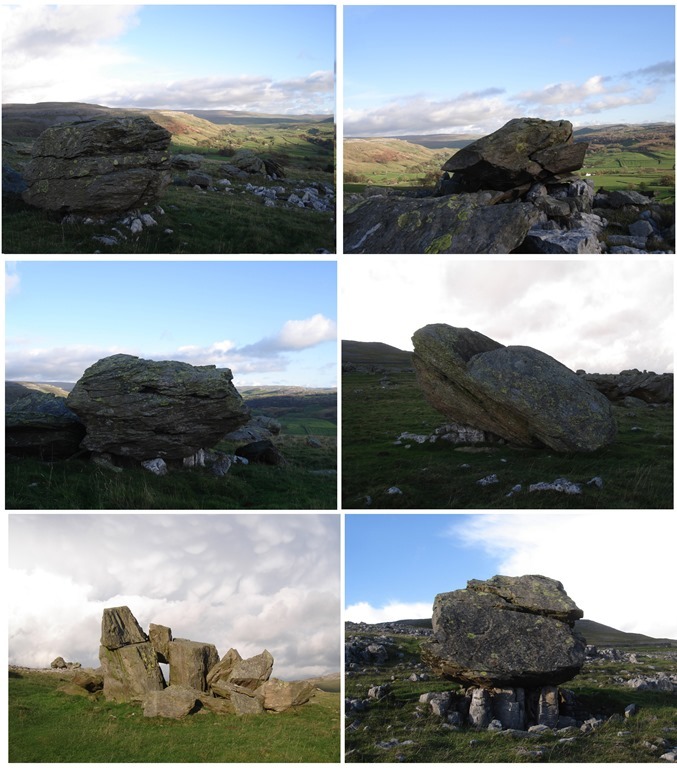 A short detour led us to the Norber Erratics. 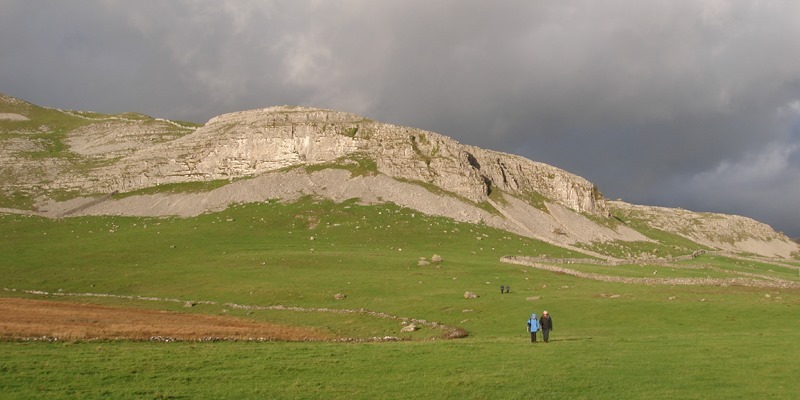 These large boulders cover the hillside above Nappa Scar. They are composed of dark grey Silurian gritstone and stand out in sharp contrast to the native white limestone bedrock. 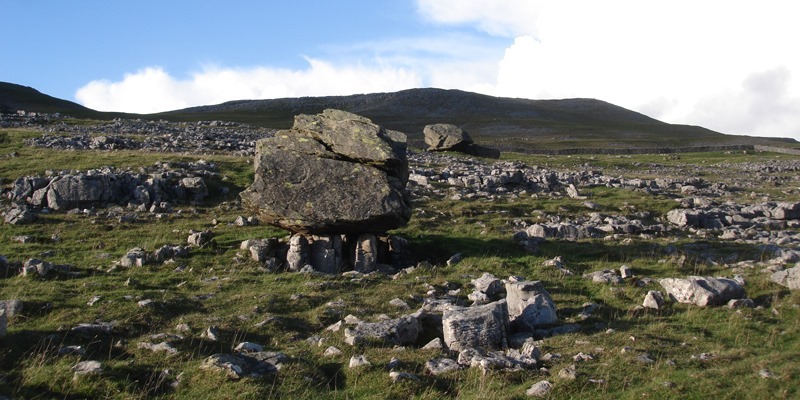 They originated at a lower level in Crummack Dale where the Silurian rock bed breaches the surface, and were transported to their present position by a glacier during the last ice age. When the ice retreated they were left on the limestone bed. Since then some of the limestone bed has been dissolved so that some of the boulders now stand on short pedestals. It has been calculated that the limestone has dissolved at a rate of 5 cm per 1000 years so by measuring the height of the pedestals you can calculate how long they have been there. Give a year or two. Finally we joined Thwaite Lane, a walled green lane that took us back to Clapham. Here we joined some of the ‘A’ party in the bunkhouse next to the car park. A bar, a wood burning stove and a choice of three real ales. This was the place to be. The Hobgoblin, brewed by Wychwood Brewery and the unofficial beer of Halloween was superb. 9 miles of good walking. This entry was posted in Sunday Walks, Yorkshire. Bookmark the permalink.